Thank you for all your support and interest in the New Old Time Chautauqua (NOTC). You all helped in making 2014 quite an amazing and meaningful year! We made some great leaps forward this year in infrastructure, concept and getting closer to the heart of our mission. We are looking forward to and slightly north for 2015.
a homestead near Orofino, Idaho, we fashioned a summer adventure that made a large loop around her native land, which included stops in the wilds of Northwest Montana and Northern Idaho. Get a full detailed story of the tour with more photos on our blog. We booked the 2014 tour quite early, which gave us time to prepare in a deeper way. A new NOTC Organizing Committee was convened this last winter called the Walking Staff. Why “The Walking Staff?” you say. When we are on the road our main tour organizers are called, in Chautauqua jargon, the Running Staff. The new committee, which organizes the Chautauqua summer tour, was then inevitably called the Walking Staff. It consists of a large group of New Old Time Chautauquan volunteers who each took on certain tasks with our community sponsors and their organizing committees. This meant more concentrated time was spent on each of our events by both Chautauquans and their community counterparts. The outcome was larger community involvement manifested by local musicians playing in our band, community based workshops and even local performers in our show. The 2015 Walking Staff is to be convened for this year’s upcoming tour. In part inspired by the life of Faith Petric, Paul Magid, a Chautauqua founder, researched, wrote and produced an exhibit on the Circuit Chautauquas. 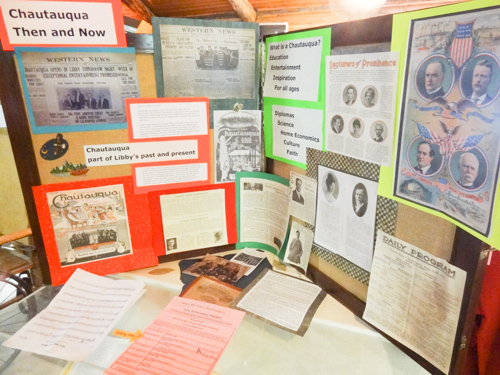 The exhibit explored the origins of the Chautauqua movement, the rise and fall of traveling Circuit Chautauquas, the life of Faith Petric, and the rebirth of the Circuit Chautauqua in our very own New Old Time Chautauqua, the last working Circuit Chautauqua in the world! The exhibit was shown in each of the museums in the towns we toured to this summer. The exhibit was premiered a month before our arrival. The kicker was that each town on tour had been visited by the original Circuit Chautauquas exactly a hundred years ago! The benefits were that the communities learned about what a Chautauqua really is, they learned about Faith’s life, they got some of our 30+year history and it afforded a bit of publicity about our impending visit. In the upcoming years we’ll be able to present the exhibit wherever we go! In late Spring we purchased a 4-horse horse trailer. We cleaned out this mobile Augean stable and installed cupboards, electricity, propane storage and our new used enormous commercial refrigerator. On tour this meant that we could park the trailer at our camp, take out the stoves, pots and pans and start cooking. We didn’t need to put food into bins full of ice anymore! It was a great leap forward for those who heroically run our kitchen. With all that wonderful food and great chefs at hand it also became the cool hang out spot. It seems all our vehicles, past and present, have bird names these days… (The Bluebird, The Greenbird.) So the trailer was named Pegasus, half bird, half horse and 100% divine! To help rebuild our mobile Kitchen we received a donation from Mark Warren and Lisa Lystad, both former Chautauquans, by way of their Lystad-Warren Philanthropic Fund. With this generous gift we bought new pots, pans, bowls, etc… Thank you Mark and Lisa. The new Kitchen utensils are called Warren Ware. Another new frontier was explored this year. Katie Still, one of our Kitchen Kueens, got into touch with local organic farmers and made food orders in March. The farmers in most of the towns visited for the 2014 tour planted the food requested so that it would be harvested for our arrival. The food for the 2014 tour was the some of the best ever and much of it was donated so our food expenses came in significantly under budget!!! Yay, Katie and Reby our Kitchen Kommittee!!! Right next to the community of Oso, Washington, which was hit very hard by a mudslide in March, the town of Darrington is struggling to re-build their local community and regain some normalcy. 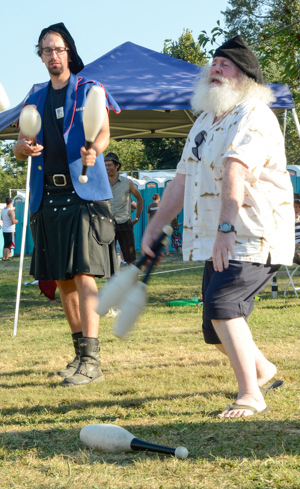 They reached out to us to bring some of our merriment to their annual 4th of July festivities. On the way there, we saw awesome devastation, a plain of mud, trees uprooted, buildings gone. Once in Darrington, the setting was spectacular with mountains jutting up so close to the town. We gathered at the Old School Park, where we met one of the local organizers, Matthew, who later joined us in the band on trumpet. 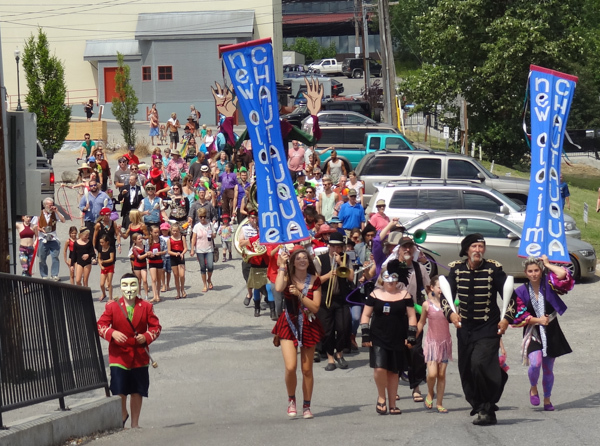 Our Chautauqua contingent, a smaller-than-usual but mighty version of our group played in the parade with mounted contingents and old-timey cars, and presented a variety stage show to an enthusiastic crowd from the town. Some enjoyed staying late for the fireworks display. In what has become an annual benefit event, we once again brought our community and skills to the Stillaguamish Festival of the River.. This unique event, produced by the Stillaguamish Tribe, is a wonderful festival; a ménage of rock/country/folk music, Pow Wow, logger games, food booths, environmental demonstrations, river swimming and us! 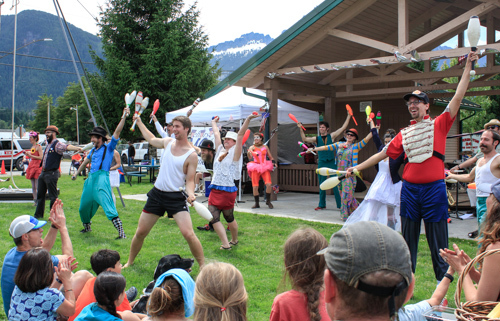 At the festival the New Old Time Chautauqua offers two daily parades, workshops, ambient entertainers – jugglers, musicians, stilt-walkers and more, and a one-hour variety stageshow. It is usually held the second weekend in August. Come on down. It’s a hoot! 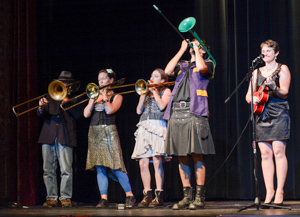 This year we had 3 fun benefits for Chautauqua on one long October weekend at the Lincoln Theatre in Mount Vernon, The Capitol Theater in Olympia and at Open Space for Arts & Community on Vashon Island. It was a great gathering of Chautauquans and the shows were super fun! Thanks to the many local sponsors and community groups which supported our visit. This spring, at a TBA date, we will be having a new kind of New Old Time Chautauqua benefit. Instead of just doing an evening show we will be giving a full three day Chautauqua in Port Townsend, Washington. That means we will be doing a community potluck, community shows, a parade, and an evening Vaudeville show. We also hope to mount the museum exhibit at the Jefferson County Historical society. Stay tuned for an exact date. It will have been 23 years since our last journey up the inside passage. We will be traveling by ferry on the Alaska Marine Highway System. At 4 ½ weeks it will also be one of our longest tours for many a year. We will be traveling some most of the isolated towns in this country through some of the most beautiful landscape imaginable. 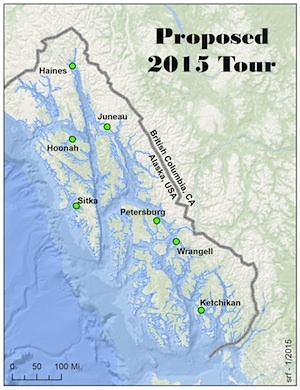 On the schedule are visits to Ketchikan, Wrangell, Petersburg, Juneau, Hoonah, Skagway/Haines and Sitka. We will be going to prisons in Ketchikan and Juneau, playing at Pioneer Homes (Alaska’s senior centers), youth detentions centers. We will also be collaborating with Tlingit Nation along the way. This year we will be working with our host cities to deepen further our connection with each community. The museum exhibit will be shown in the local museums as it is also the case that the original Circuit Chautauquas played SE Alaska nearly a hundred years ago. Touring the Southeast is costly as we will have to pay the Alaska Marine Highway for tickets (we are getting a 50% discount). So this year we will need to do some major fund raising so that we can continue to fulfill our mission of bringing Chautauqua to rural towns and celebrating community through education, entertainment and laughter! That was a gentle reminder that you can help support this work through your generous donations. We are working with Washington State Parks Folk and Traditional Arts person Debbie Fant to tour 5 or 6 Washington State parks in the summer of 2016. We will be working to bring awareness to the parks and collaborating with nearby towns fulfilling our mission as well. "Had a blast with all the workshops and at the show at Ohs! Thanks for coming to our little town!" "Wow, what a great show and what a way to reach a community that is in need. We felt a sense of community that lacks so greatly in our area. People are coming up to us and thanking us for having you perform. Wanting to know when you will be back and missing you already. We have racked out brains to try to bring something to this community that would generate the warmth and appreciation that you achieved. I can not even express what it meant to me to watch my grand daughter give a solid standing ovation to the juggling act through their entire performance. She was elated. I had an elderly lady grab my arm at the end of the show and state "I am so happy I don't want to leave and I don't want them to go"! Thank you for this wonderful event and hopefully we can have more. We appreciate the support of our audiences and the communities we visit. Please help us continue what we do by spreading the word, sharing our video, or donating towards our tour costs. 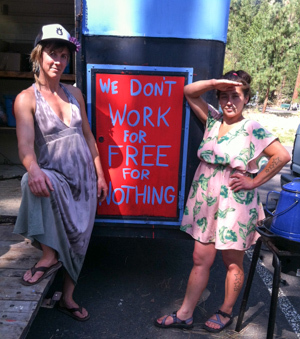 We run a very low-budget tour operation camping in tents and feeding our 60-person troupe from our portable outdoor kitchen, but every cent helps us keep the vehicles on the road and the musicians, performers, workshop leaders and tour organizers going! New Old Time Chautauqua on the road! Copyright (C) 2014 New Old Time Chautauqua All rights reserved.